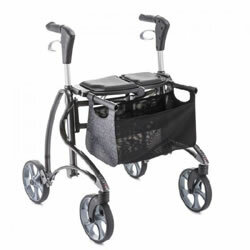 Wheeled lightweight walker with easy cross fold design for storage and travel. Dolomite Jazz Lightweight Folding Walker is constructed with a welded aluminum frame for weight savings. The cross fold design is easy to close for storage or when traveling. Pull loop on seat to fold, side to side manor.